The state-of-the-art dance studios of the Kenyon Athletic Center (KAC) are a world apart from the common room of a student apartment, but both work as the setting for a campus trend. Kenyon students have discovered the physical and psychological benefits of yoga--flexibility, core strengthening, and stress relief. "I get really stressed with work, and yoga clears my mind," said Lora Pacht '08, pictured at left with Chris Chanock '08. Pacht founded the yoga club last year with five other students. After applying for special-interest housing, the club leaders started the 2007 school year in one of the New Apartments, assigned to the club because it has the largest common room. Dubbed the Yoga House, it is now equipped with tapestries that set the stage and a large yoga mat covering the common-room floor for transcendent stretching. Six days a week, the Yoga House offers yoga and yoga spin-off classes ranging from the more upbeat Yogalates (yoga and pilates) class to the low-key meditation event known as Transcendental Tuesday. Other classes include Yoga Therapy, Carpe Diem Yoga, Group Massage Therapy, and the Yoga Weekend Wind-Down. Though space is limited, as many as fifteen students have shown up at the Yoga House for group massage therapy and other sessions. 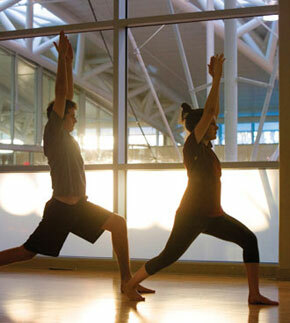 Across the village, the KAC offers Yoga Fusion and Vinyasa Yoga several days a week. An anthropology major working on her honors thesis, Pacht started taking yoga classes during her junior year of high school and continued at the KAC until she started teaching her own classes at the Yoga House.